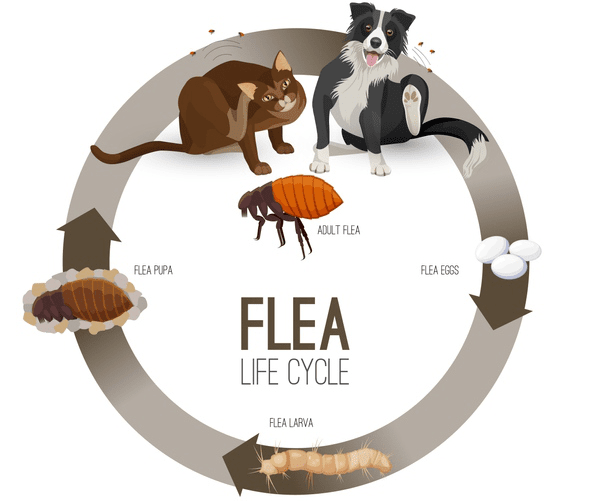 Just thinking about fleas and flea eggs can make all pet owners feel itchy! Like the black-legged tick, fleas are nasty little blood-sucking bugs that feed on mammals—including dogs and humans. If you have a dog that has boundless energy and loves being outdoors, the chances of him picking up fleas increases dramatically. Dogs that are homey and love just curling up on the sofa are far less likely to suffer from a flea infestation because their time outside is limited. 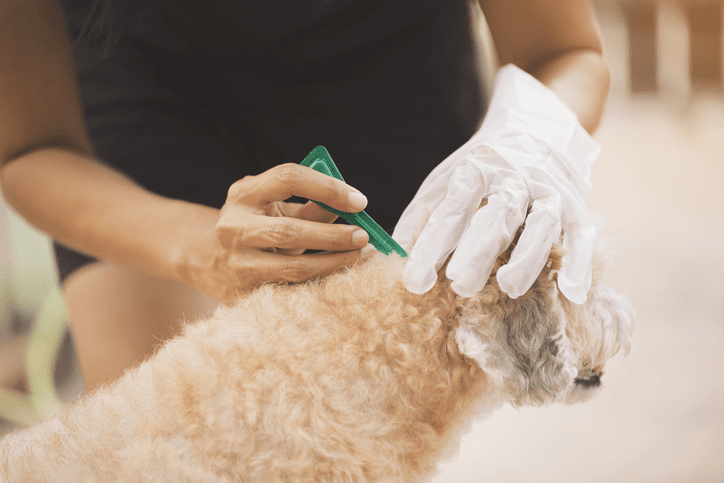 Though it is hard to prevent fleas, treatment is quite easy. So, when you have a dog, you need to find the best flea preventatives and treatments possible. Preventatives usually come in chewables, topicals, or collars and can be purchased from your vet or a specialty pet store. It’s important to not only know how to spot a flea infestation but also what dangers fleas pose to your dog’s health. It is easy to spot adult fleas. They are black or dark brown and move quite quickly. They are also capable of jumping short distances. Flea bites can cause inflammation, itchiness, and irritation on the skin and other adverse reactions. This is true for both dogs and humans. Fleas are a nuisance and can cause multiple illnesses or transmit diseases. Flea Allergy Dermatitis – this allergic reaction can happen in dogs bitten by fleas. Dogs allergic to flea bites develop a skin infection and become intolerably itchy. Allergic reactions usually occur around the tail or bottom area of the dog. Tapeworms – yes, it is true. Fleas can transmit tapeworms through their bite. These gastrointestinal parasites feed off the nutrition your pet digests. A single tapeworm is rare—once dogs sustain a flea bite, they usually become infested as they digest adult fleas carrying tapeworm eggs. Plague – while the plague is incredibly rare, fleas are a carrier and your dog can become infected. Dogs infected with plague will develop a fever and swollen lymph nodes. The plague has been known to cause sudden death in dogs and, of course, is lethal for humans. Therefore, get your dog to the vet right away if he develops a fever, is lethargic, or has swollen lymph nodes. The first step is a nice, warm bath. Any pet shampoo that makes a frothy lather will definitely kill fleas. 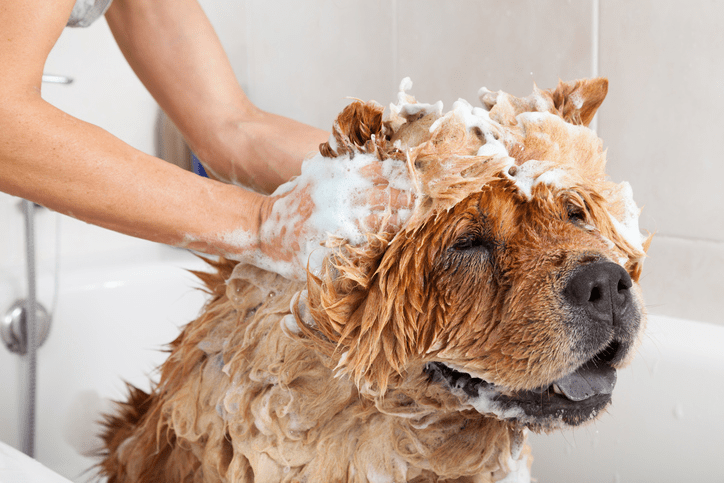 Wet the dog, lather up the fur and let it set on the dog for 3–5 minutes. Rinse the dog well with warm water. To ensure you have removed all of the adults, flea larvae, and eggs, follow the rinse with apple cider vinegar to help balance the pH levels on your dog’s skin. This creates an acidic environment that fleas hate. Use about a ¾ cup of apple cider vinegar mixed with ½ cup of water. Put the mixture in a spray bottle along with ¼ teaspoon of salt. Shake it up and then spray all over your dog’s fur. 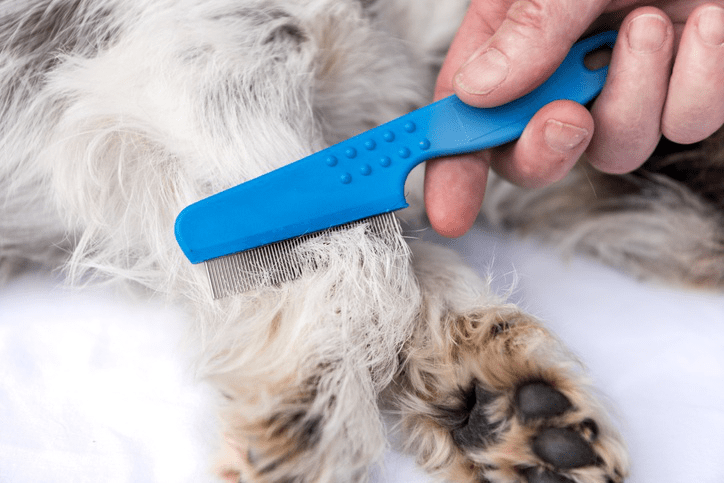 Finally, once your pet is dry, run a flea comb through the fur. If you see any live fleas or remove any flea eggs, you may have to repeat the process or move on to another treatment. If bathing with natural options doesn’t do the trick, bathe your pet in a flea shampoo recommended by your vet. Treat the dog with flea spray, and use a fast-acting oral treatment that can kill fleas within an hour of dosing. But don’t think you have won the war—flea infestations on your dog likely mean you have a flea infestation in your house. While getting fleas off your dog is a relatively easy process, cleansing your house of the little parasites can literally take months. This is due to the flea life cycle, where eggs and even adults can lay dormant for long periods of time. The best way to clean it up quickly is to start your dog on a flea preventative as soon as you know the dog is clear of fleas. Now, clearing the home of fleas takes lots of work and lots of patience. You will most likely not get rid of them the first time you go through the process. That said, at least there is a technique for completing a flea purge. First, throw everything you can into the washing machine, including dog beds, dog blankets, dog pillows, towels, and T-shirts. Put whatever you can in the dryer for 15 to 20 minutes set on high. This will kill eggs, larvae, and adults. Next, make it a habit to vacuum every day. Don’t miss a single corner or crevice. These nasty critters like to hide in the dark, so don’t overlook a single centimeter of carpeting. After each vacuuming session, empty the bag or canister immediately. If you don’t, the fleas you sucked up could escape. To kill fleas quickly, spread diatomaceous earth (DE) over all surfaces and leave it for two days. Always use human-grade DE for your family and pet’s safety. DE will dry out the exoskeleton of the flea and destroy eggs and larvae. After the two days are up, vacuum well and empty the bag or canister. Other natural options include baking soda or coarse salt. Both have the same effect as DE—they dry up the eggs and destroy the exoskeleton of the flea. There is just no guarantee that the fleas will be dead within 24 hours. 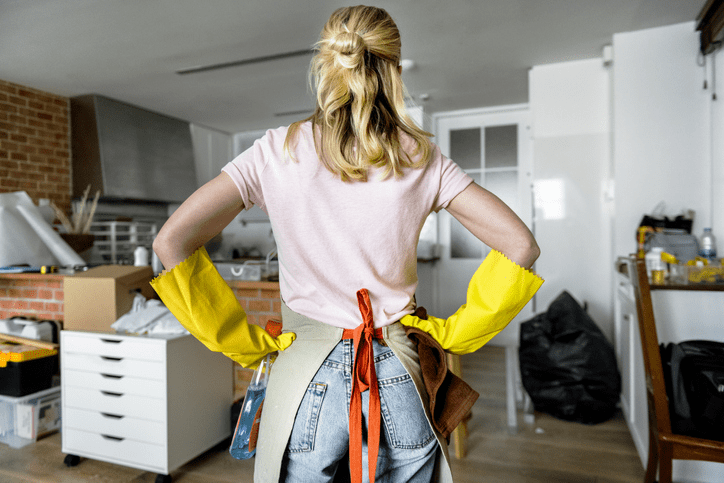 Allow these to work for 36–48 hours before vacuuming. You should also consider using a steam cleaner at least once monthly to kill fleas and remove flea remnants from the carpets. After doing a little research, use the steam cleaner on any furniture that will tolerate the hot water and cleaners. If you keep this cleansing routine going for at least 30–60 days, you should find your pet and your home free of the festering fangs of fleas. You can also use DE on your yard. Human-grade DE is not a threat to pets but will kill fleas within 24 hours. There are other chemical options for treating your yard for fleas, but those should only be applied by licensed professionals. To reduce the likelihood of a repeat infestation, treat your yard as well as your pet and home. Once you know your dog has a flea infestation, it is so important to get rid of the fleas for your pet’s health and your family’s as well. Once the infestation is under control, make sure to use preventatives (chewables, topicals, or collars) on your dog to prevent future infestations.